In stock - low quantity. Order in the next 5 hours, 56 minutes and it will go out today! A clever device which allows for the smooth appearance of a dove, one handed. You can produce magically a dove from a silk automatically without any hand movement. 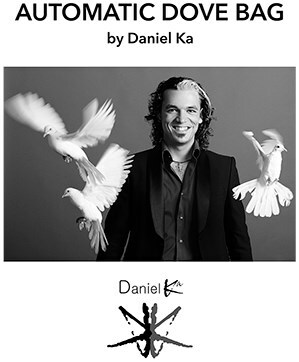 Daniel Ka is an award-winning magician from Spain and devised his one-handed dove bag while building his award-winning doves act. He wanted not only astonish the general public, but fool magicians as to how he could steal a dove load and not have to use two hands to open the load bag. This new-concept bag leaves you free to merely make a massaging motion to make the dove appear. It's simply beautiful to watch. There is nothing to pull, open, unsnap or disengage once you have the bag in your hand. If desired, you can directly thrust the dove forward into the air for its circular stage flight to dramatically conclude a beautiful dove production. It's that straightforward. Once you load the bag in your hand you control when you want to produce the dove just opening that hand.